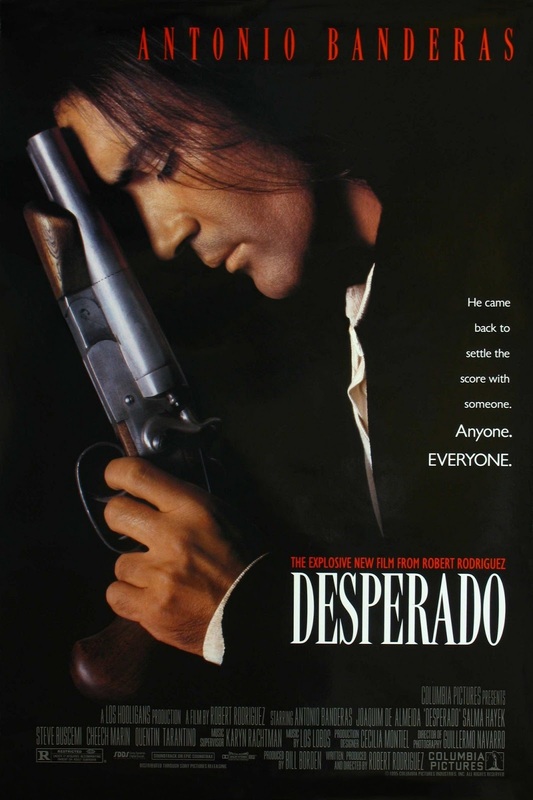 Chrichton's World: Review Desperado (1995): An action classic through and through! Review Desperado (1995): An action classic through and through! Desperado is the sequel to low budget film El Mariachi which was written, directed, filmed and produced by Robert Rodriguez. He did all of this with a budget of merely 7000 US dollars and is an example of how you can do a lot with very little. The sequel still very much Rodriguez's baby but now with backing of a big Hollywood studio and bigger budget. The action sequences are wild and spectacular intertwined with many funny comedic moments and some dramatic dynamics to make everything more interesting. Plot? There is very little. In essence it's about the main character from El Mariachi now played by Antonio Banderas who is out for revenge and in search of crime lord Bucho. He isn't very subtle about it since wherever he goes it ends up in massive shootouts that become very violent and bloody very quickly. In between the spectacle time Banderas has a romantic outing with Carolina played by the beautiful and hot Salma Hayek. Their chemistry is amazing. Even when they just stare at each other you feel the sexual tension between them. Because of this it's not needed to have them build up a relationship conventionally. You just buy them as an instant couple. Banderas also has some great moments between Buscemi and I personally would have liked it if they had more of them. Buscemi acts as his conscience and without him Banderas has the tendency to take it too far. How far he can go is shown in the many action scenes this film has. Some call this a contemporary western and others will notice the plentiful of John Woo esque moments which make it very hard to deny that Robert Rodriguez is not inspired by Hong Kong cinema. Funny thing is that John Woo himself was heavily inspired by Sam Peckinpah and his The Wild Bunch in particular. Almost has made it come full circle. But judging from the films Robert Rodriguez has made is that he doesn't want to be restricted to one genre. He likes to mix it up as much as possible. And he does all of this with a very recognizable style and flair. Apart from recent failures (like Sin City: A Dame to Kill For) it is those elements that makes his movies a lot of fun. Desperado holds up today just as much as the first time I have seen it. I might have seen this twenty times by now if not more. Antonio Banderas is so cool and suave in this one. They should have made more films like this. He has a real knack for doing action adventures. Anyway, if you haven't seen this by now and you love action you really owe it yourself to watch this at least once.